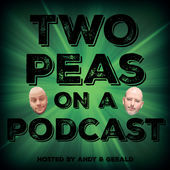 Gerald and special guest, Tim Beeman (The Less Desirables), discuss a wide range of topics including North Korea, Trump’s feud with CNN and ‘Morning Joe’, American Idol’s newest rival, Lindsay Lohan’s patriotism, 2Pac, Chris Christie (the beach bum), Happy Birthday SPAM and much more! Enjoy and share! Find our guest Tim online at The TLD Network and on Twitter @LessDesirables & @TLDNetwork. Find this week’s featured #PodernFamily shows on Twitter @Twisted_Philly & @QuadFatherMft. Intro/Outro: “Detroit Rock City” by KISS. 1976, Record Plant Studios. All Rights Reserved.